Inviting guests affirms Jewish traditions and southern hospitality for family. New Atalanta shinshin Lior Bar gets acquainted with Krispy Kreme doughnuts. Those were some of the surprising responses to news that our family would be hosting a young Israeli for the coming months. There were, of course, others who thought it cool, interesting and exciting, but I was surprised at the number of people who expressed concerns. I viewed the chance to welcome someone into my home as an opportunity. After all, as I pointed out to those who asked, we were already hosting another young person over the summer, a close friend of my son’s doing an internship in Atlanta. Besides, opening the doors is a very Jewish, American and Southern thing to do. In the Bible, Abraham, still healing from his adult circumcision, sees three strangers coming toward his encampment and quickly has Sarah prepare a meal of welcome. This easy openness became the base of the Jewish tradition of hachnasat orchim (welcoming guests), for, after all, once you open your doors to strangers, they stop being strangers and become guests, a real flesh-and-blood people. According to legend, King Solomon sent traders to India to bring back spices. Their boat crashed on shore, stranding them on rocks through the night. Local people came in the morning and rescued them, welcoming the traders into their homes and communities. That welcome persuaded the traders to stay and make India their home for the next 2,000 years. For thousands of years, the Jewish community survived by opening doors. Keeping kosher was a given, as was traditional Shabbat observance. Jewish travelers relied on Jewish strangers to open homes and share food at stops along the way. Surely some made payments, and others did not. But either way, the impact was the same: connections forged between strangers strengthening ties across divides. After the founding of the state of Israel, my mother, who was a young child, and her father often went to deliver candies to the displaced people in the refugee camps. On one such trip they encountered a family my grandfather had known in Zagreb before the war. They brought the family back to live with them in their two-bedroom apartment. When I was growing up, there were often strangers living in our basement. Graduate students. Newcomers to Canada. People who needed a place to stay until they got on their feet. Today, my children make fun of me for talking with strangers, but it has led to some amazing connections. My friend from clay class with whom I go on culinary adventures. My friend from Trader Joe’s who is now in L.A. chasing her musical dreams. When we arrived in Atlanta two years ago, the Southern hospitality swept us up in Shabbat dinners and coffee dates, making our family feel at home. Our country has a long tradition of welcoming strangers, people whose customs, garb, language and food are foreign to “us.” From that tradition, we have reaped countless benefits, innovation in culture, cuisine, medicine and technology. That which is strange can open up possibilities we would never imagine on our own. Which is why I saw opening our home to an Israeli teen not as a burden, but as an opportunity. Lior Bar arrived in Atlanta in late August as an emissary of the Jewish Agency’s Shin Shin program, which sends pairs of young people to spend a year volunteering in the Jewish community, sharing knowledge of Israel and Hebrew and just being a positive force in communal spaces. This is the first year that the program has extended to Atlanta, and we were excited to help host one of the two eager volunteers. Having her in our home does mean feeding another mouth and making space in the guestroom. It also means a smiling, positive presence engaged in family life. 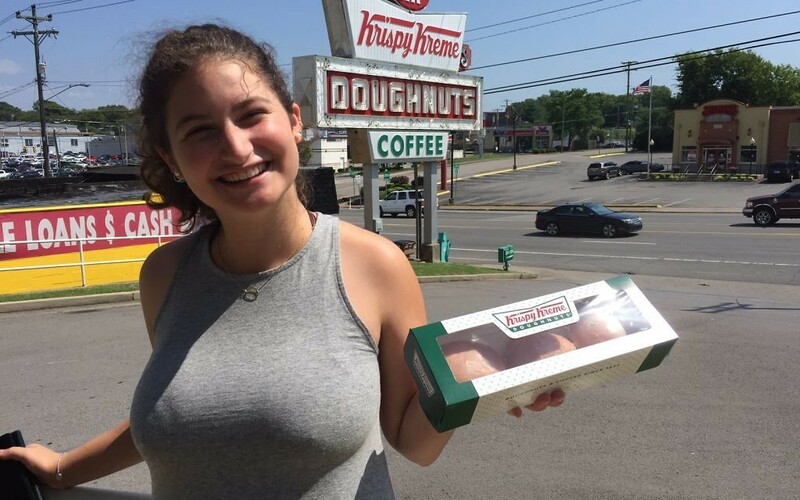 In the short time since her arrival, we have had an eclipse adventure in Nashville, made some extraordinary challahs and reacquainted her with Krispy Kreme Doughnuts. There is more Hebrew in our home and lots of interesting conversations. No longer strangers, we are glad to have opened our home.